Hey guys, Happy (late) Easter. I just wanted to ask If you would mind if I set up a thread dedicated to this particular line of toys from Bandai, as both SH Figuarts and Monsterarts have threads here already? What entries would you like to see from this line? I would do anything for a Soul of Chogokin Dragonzord. Feel free to elaborate ladies and gentlemen. Only have 1, The Getter Dragon. Would like to see more Toho characters done like this. Too early to tell which Chogokin sub-line they'll be under. The SoC Daizyujin is now available for purchase. Look up the reviews on Youtube. Now if only we can have a prototype of an SOC Dragonzord unveiled to us. Watched a review of the Chogokin Big O. Damn that things got a ton of cool gimmicks and its a,fairly good sized figure too. I've been thinking of picking one up for awhile and that review really helped seal the deal for me. Why? Are you not a fan? I think his reasons for disliking the Megazord are the same as mine. In terms of what we're talking about here, we're not talking about from a Power Ranger standpoint, but from a SOC standpoint. Much as it pains me to say, the GX-72 Megazord does not match up to the quality of most SOC figures. GX-68 GaoGaiGar came out 3 years before this toy and that had much better stability and better head articulation. What does the Megazord have? Forearms that do not stay transformed because Bandai did not make sure that the forearms actually lock in place when you transform the Mastodon during Megazord mode. We live in the year 2017 and they seriously haven't taken one single look at the original 1992 daizyujin and took a look at the problems on those arms? Why is that so hard for Bandai to do? Not to mention the fact that the Triceratops treads do not stay locked open and neither he nor the saber-tooth tiger have wheels. There were so many balls that were dropped with this whole figure that it really does not warrant a $275 price at the very least. I wouldn't even buy it for 175. Maybe a 125? But all those Goofs with this figure do not warrant a $300 price tag on that figure. This is soul of chogokin for God sake, not just a slightly better version of legacy. JobbyTheHong's recent review of this toy cemented in several problems with the whole thing that honestly in my opinion is inexcusable. I almost forgot to add this in but I will give Bandai this much credit on the Daizyujin, the detail in the paint apps are phenomenal, absolutely no stickers of any kind. It's very faithful to how it looks and just the chrome look on it is just beautiful, it has both the best of a classic toy with new design features that look good but still need a bit more work. Last edited by THECRAZEBLING on Sun Jul 16, 2017 1:08 pm, edited 1 time in total. Forearms that do not stay transformed because Bamdai did not make sure that the forearms actually locked in place during Megazord mode. We live in the year 2017 and they seriously haven't taken one single look at the original 1992 daizyujin and took a look at the problems on those arms? Why is that so hard for Bandai to do? My biggest gripes with the figure are that the canons on the back are a tad too high and the wheels/treads don't move. And let's not forget about the Tyrannosaurus' feet not being stable ENOUGH to have him stand like an actual T-Rex as opposed to how T-Rexes were assumed to stand like back before research was done on the dinosaur. Then again research on that issue was probably done during the 90s and they couldn't do anything about it because it was just a guy in a robot T-Rex costume. But then again the feet aren't too unstable but you would figure that they would tweak the toy little bit to compensate for the amount of diecast in the figure. That weight has to go SOMEWHERE. And what is it about the God Horn that they can't get quite right about it? I know it needs to have some handle space on it, but did the grip really have to be that long? Let alone just be made out of plastic? Because remember, this is a soul of chogokin toy and it's not meant for young children so why make that sword out of F'ING PLASTIC? That chrome paint is bound to wear off at some point or another regardless of whether it's used frequently or not. THECRAZEBLING wrote: And let's not forget about the Tyrannosaurus' feet not being stable ENOUGH to have him stand like an actual T-Rex as opposed to how T-Rexes were assumed to stand like back before research was done on the dinosaur. Then again research on that issue was probably done during the 90s and they couldn't do anything about it because it was just a guy in a robot T-Rex costume. But then again the feet aren't too unstable but you would figure that they would tweak the toy little bit to compensate for the amount of diecast in the figure. That weight has to go SOMEWHERE. Maybe in the next couple of years, Bandai could do a re-issue for the SOC Daizyujin, like how they did with Voltes V.
Gypsy Danger in SoC form formally revealed! Forgive me for asking a silly question but what exactly is Soul of Chogokin and why is it called that? bczilla91 wrote: Forgive me for asking a silly question but what exactly is Soul of Chogokin and why is it called that? wikipedia wrote: Soul of Chogokin (超合金魂 Chōgōkin Damashii) or "Soul of Super-alloy", is a popular line of adult collector's toys produced by the Japanese company Bandai. The line, which began in 1997, focuses almost exclusively on mecha (robots) taken from various 1970s and 1980s anime series, although the line has diverged from this on a number of occasions, most notably the release of several mecha from the mid-1990s anime Neon Genesis Evangelion. More recently, the line has expanded further to include 1970s mecha from Super Sentai and other tokusatsu series, such as the Battle Fever Robo from Battle Fever J and Leopardon from the Japanese TV adaptation of Spider-Man. In 2017, Bandai will be releasing yet another Super Sentai mecha Daizyujin from Kyōryū Sentai Zyuranger which happens to be the first Super Sentai series adapted for American audience under the name Power Rangers as the first season of Mighty Morphin Power Rangers. This would mark the first Power Rangers Megazord to be given the Soul of Chogokin treatment. 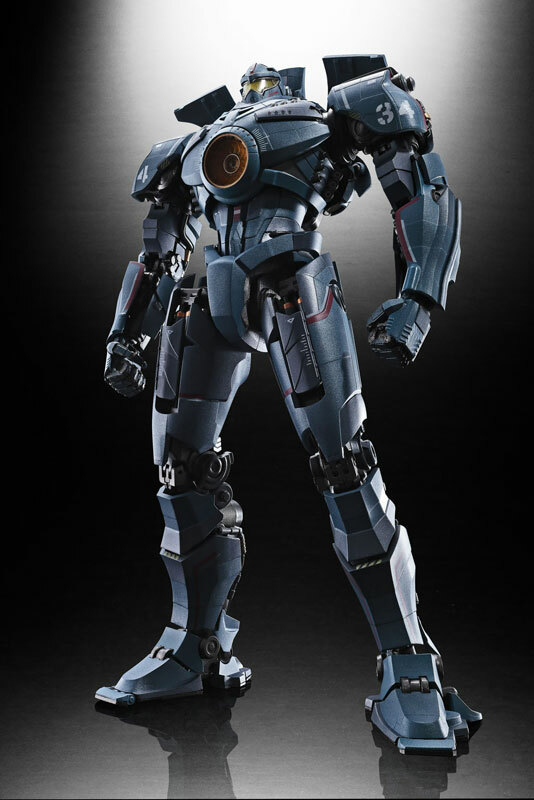 Also in April 2017, a prototype for an SOC figure for the robot Gypsy Danger from the 2013 film Pacific Rim was unveiled. Collection DX - Soul of Chogokin wrote: Soul of Chogokin (超合金魂) or SOC, is Bandai's high end line of collectible robot toys. They embody the spirit of the vintage Popy and Bandai Chogokin toys of yesteryear. These toys are not meant for children, rather they are aimed at the adult collector with disposable income, looking to recapture a bit of their youth. The line began as Bandai was winding down their Hi-Complete Model line. The last figure in the line was meant to be Mazinger Z, but they decided to turn that prototype into the first entry into the new Soul of Chogokin line. The line debuted in 1997 and was met with critical acclaim. As the line continued, Bandai refined their process and went back and re-did certain entries in the line, resulting in R or Renewal versions. Soul of Chogokin toys come from a variety of shows and different eras in robot history. Some of the defining characteristics are that they all have a number (GX), all have some sort of metal content, and all represent the spirit (or soul), of the original character. Hearing this brings me so much joy. Discussing the possibility of such a figure being a reality is what essentially what motivated me to start this thread in the first place.